People are often surprised to hear that 65% of 4th graders are reading below grade level. Because these students are unable to make the switch from “learning to read” to “reading to learn”, their lag in reading has long term implications on their schooling and beyond. 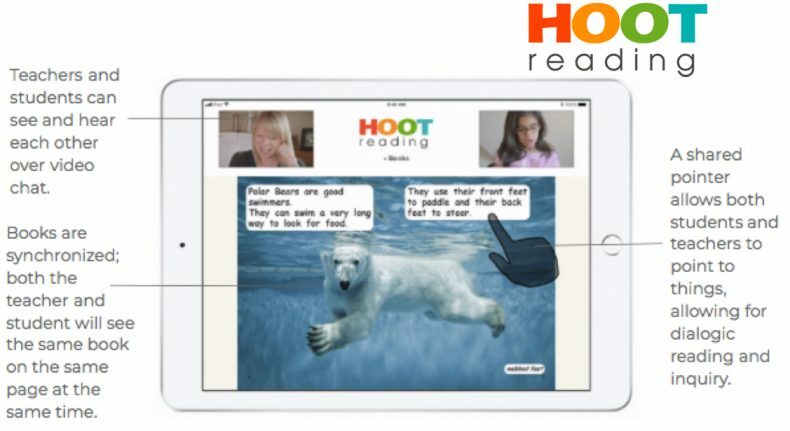 Hoot Reading is an online tutoring service that connects emerging readers with experienced teachers to practice reading online. Our proprietary video-chat App was incubated on a research project at Sesame Workshop (Sesame Street), where one of our cofounders was working at the time. It combines video-chat with reading – think Skype, but with books. For under $100/month, which is a fraction of the price of a traditional tutor, students get private reading sessions with real teachers, all from the convenience of their own home. We launched Hoot Reading in January 2018 and have grown MRR an average of 61% monthly. Online tutoring is a hot market, but at this point focuses on older kids, English language learning, and math. Hoot Reading is the only online program specifically geared towards reading, which is the single most important subject for children in early elementary school, presenting a huge opportunity for both financial and social impact.